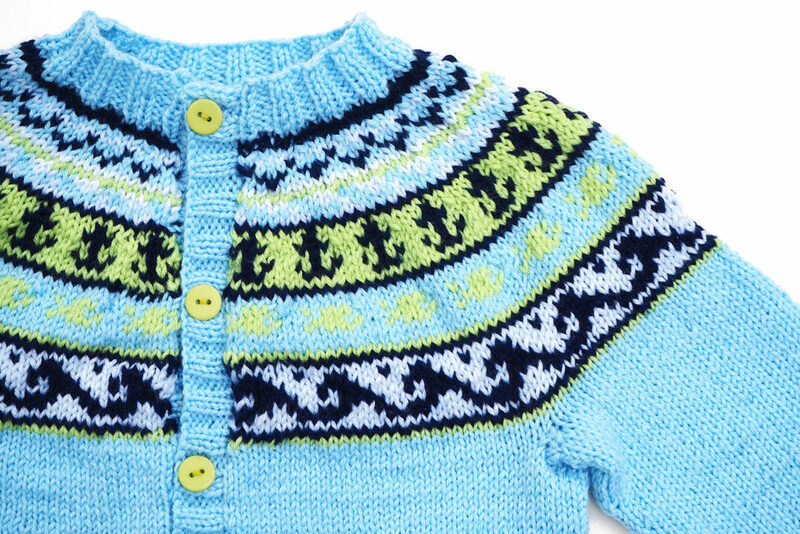 When I first began publishing knitting designs, I started out with children’s clothing designs. They were fun, relatively simple, and quick to knit. They seemed more manageable to me as a first-time designer. They also did double duty as actual garments for my own child, and many were designed with him in mind. These days I tend to have grown up with my designs, and most of them are for adults. But every now and then I love to come up with a new baby design, just for fun. 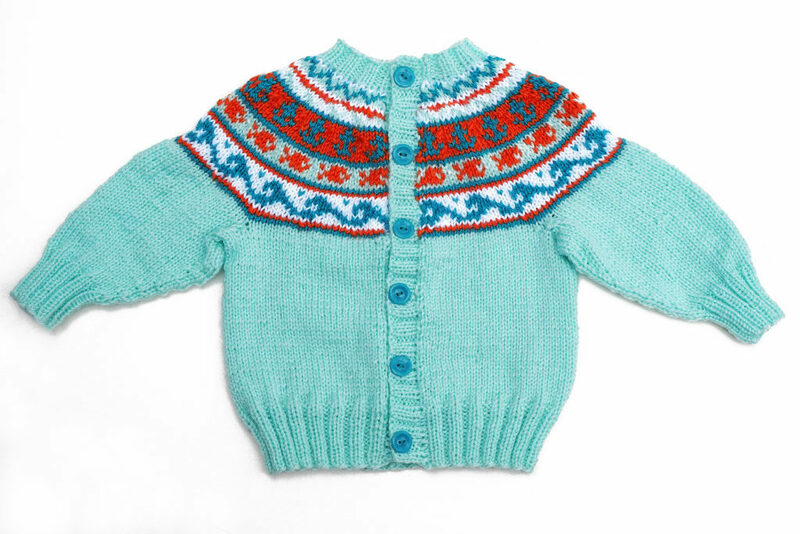 The Something Fishy Baby Cardigan I put together for a call for submissions featuring “basic baby garments.” Unfortunately, my idea of “basic” doesn’t seem to mesh well with other people’s idea of “basic,” so my design didn’t make it into the collection. I worked it up anyway and released it on my Ravelry site – why not? I test knit it in the 12-18 month size, and my mom very kindly knit up the 0-6 month size. Something Fishy in blues, 12-18 month size. Something Fishy in greens and orange, 0-6 month size. 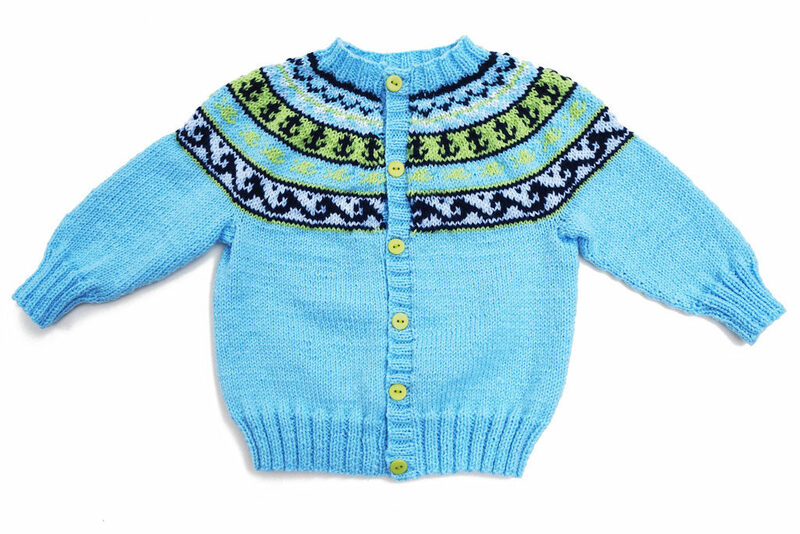 It’s a fun little nautical knit with basic Fair Isle motifs in the yoke. 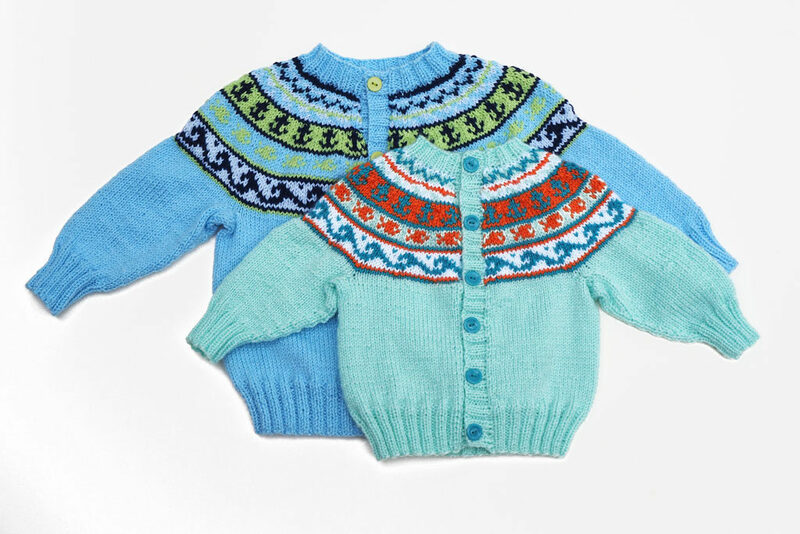 The body is knit flat, the sleeves are knit in the round and attached, and the yoke is knit flat as one piece. I love these basic ingredients to a tried and true baby cardigan! Since we’ve been spending so much time at the beach this summer, the nautical theme is especially fitting right now. 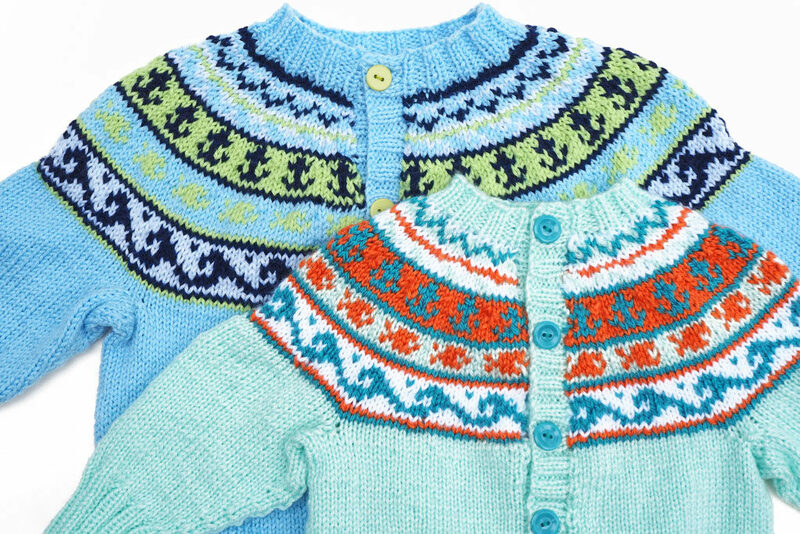 Little waves, fish, and anchors are easy to knit, because they contain no long carries and only two colors per motif. I do think this sweater would be a perfect introduction to knitting a yoke sweater for the first time. It also works well for baby girls and boys, and you could choose any number of color combinations! The contrast colors in the yoke use only a very small amount of yardage. Only the main body color needs a full skein (or two for the larger sizes), so this sweater is a good way to clear out your stash. Now that I’ve got this sweater design up and going, I’ve started a new design for an adult crossover cardigan. It has a simple lace stitch on the upper body and sleeve cuffs, and I think it will be a very flattering design for any body type. I am so in love with the yarn I’ve chosen for it! More on this new design in the upcoming weeks!